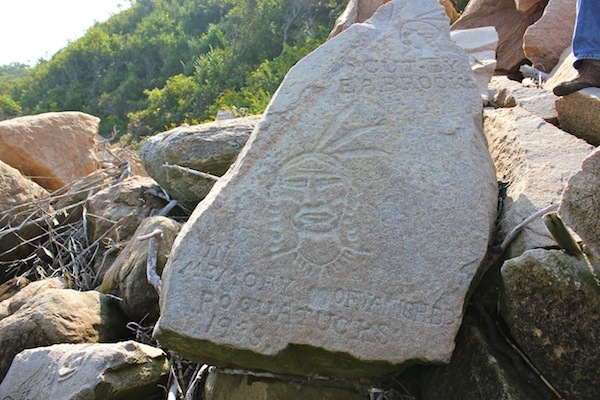 There’s little record left of the Poquatuck Indians of Orient, except for a fisherman’s tribute carved into the rocks on the Long Island Sound shore in the 1930s, and even that record appears to be fading as time and storms weather the rocks. It isn’t easy to find Orient fisherman Elliot Alvah Brooks’ stone carvings, which he dedicated to the “memory of the vanquished Poquatucks,” along the shore of the Long Island Sound, and people who live in Orient like to keep it that way. When I begged to see them on a Tuesday afternoon in September, I was blindfolded and led to the passenger seat of the truck owned by one of the few people who knows how to find them. We drove for what seemed like ages down a bumpy dirt road, then parked as I was led by the hand down to the cliff’s edge. At first, all there is to see is a jumbled pile of rocks deposited by the receding glacier that created Long Island, but as you sit and study, you realize you are in the middle of history. E.A. Brooks, the name he used to sign his carvings and paintings, called his boulder project “Bear Rock Studio.” In total, he carved 25 figures in the rocks over the course of several years beginning in 1933. Most of them are of the faces of Poquatuck Indians, but in a complete stylistic departure, one is of the outline of a polar bear, four feet high, facing out toward the Sound. The carvings have since been cataloged by the Smithsonian Institution. “I tried chiseling out some figures, and being a great lover of Indian lore, conceived the idea of leaving a monument to the vanquished Poquatucks,” he said in an interview in the historical society’s records. Mr. Brooks was born in 1888 and died in 1949. He lived at the corner of Navy and Orchard streets and was buried just down the road from his home at Orient Central Cemetery, said Amy Folk, the collections manager at the Oysterponds Historical Society in Orient. He was known throughout Orient for his knowledge of Poquatuck lore and his collection of Native American artifacts. Along with his brother Frank, he began painting late in life under the tutelage of Hortense Knox, and began carving boulders along the sound shore in 1933, said Geoffrey Fleming, director of the Southold Historical Society, who said Mr. Brooks’ paintings weren’t of serious note. Ms. Folk said, at one point, the Oysterponds Historical Society had considered moving the rocks to the historical society’s headquarters, but the logistics of moving the heavy boulders and the legal issues regarding who owns which sections of the intertidal shoreline have kept them in place where Mr. Brooks carved them. “That didn’t really fly,” she said of the move. The photographs on file at the historical society, taken at regular intervals since the carvings were made, show the gradual deterioration of the stones. But even some 2006 photographs in the collection seem much more clear than the stones do today. No, I’m not telling. I don’t know where they are. But I’m glad I had the chance to see them before the memory of the carvings becomes as blurry in our collective consciousness as the memory of the vanquished Poquatucks is now.